Google's newly launched Pixel 3 phones are mostly incremental upgrades over their predecessors. Google could very well make a comeback with some exciting devices next year, as word of two more devices surface in the wild. Update: Over the past week, the previously unknown "Sargo" has received most of the media attention and has even been leaked in full. 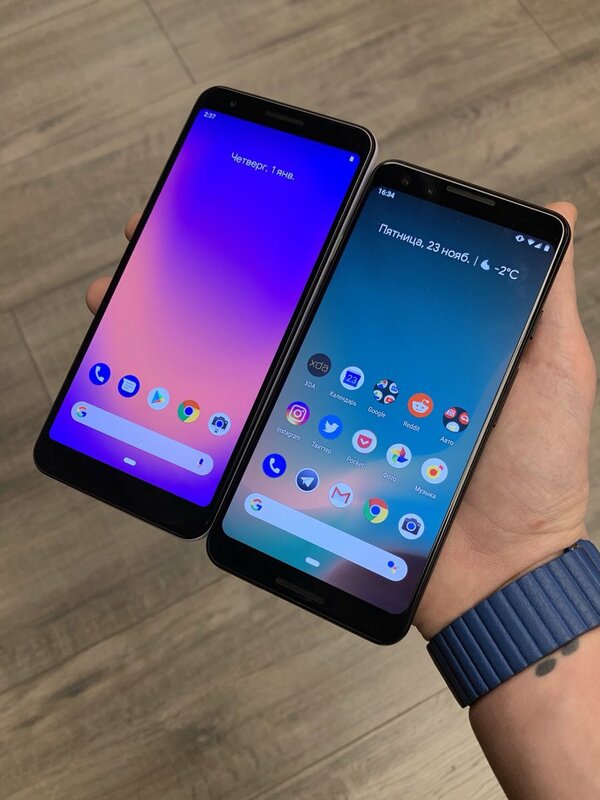 What appears to be a live image of the mid-range Pixel has surfaced, showing it sitting right next to the regular Pixel 3. Both devices share a number of features, most notable being the huge top bezel and chin. The Pixel 3 Lite—the one on the left—has a slimmer display, and sports neither a second selfie sensor nor the bottom speaker grill that can be found on the flagship Pixel 3. The image can be found at the bottom of the page. Google released the Pixel 3 and Pixel 3 XL over a month ago. Both devices were leaked in full well ahead of the launch event and made for rather uninteresting offerings at the time, so it was something of a disappointment when Google confirmed all the leaks at launch. While the two flagships aren’t the most exciting of releases in the recent past, it would seem that Google has something a bit more intriguing in the works. According to Android Police, a teardown of Google’s ARCore APK has revealed the existence of two unreleased Google devices. The first goes by the codename “Bonito”, while the second is labelled “Sargo”. This isn’t the first time we’ve received word of Bonito. That particular device has been referred to a number of times by credible sources over the past five months or so. The consensus is that it will be a sub-premium device by Google, and will be powered by a Snapdragon 710. A few months ago, there were reports that Google was working with Xiaomi on a device, and there’s a slim chance that Bonito is the device in question. The second device “Sargo” is an unknown quantity at the moment. The source report believes there’s a chance it’s a smaller, cheaper sibling of Bonito—or it may very well not be a smartphone at all, although we’re pretty sure that’s not the case here. Release dates remain unknown. It wouldn’t be at all surprising to see Bonito launched in the first quarter of 2019, though.